Just heard the wonderful story on NPR about the Ponseti Method. You continue to do great work impacting the lives of so many children and adults! My sons and I are very grateful for the twenty two productive years you gave Bill after his Ilizarov surgery. Sadly, he died in 2011 from pancreatic cancer. But I have not forgotten our many trips to Baltimore and how blessed we were to meet you and your fantastic team of surgeons and nurses. Thank you for the good memories and the good years! I would like to write this post as a thank you to Dr. Noman Siddiqui. I was born with a club foot, and at the time I was born there were not many doctors that specialized in dealing/treating it. 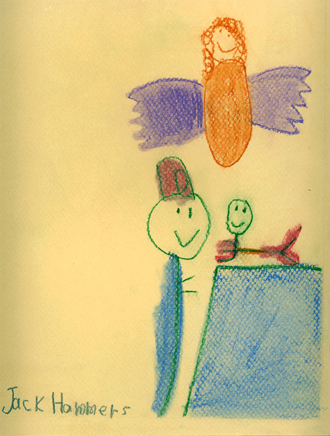 I had a good doctor for much of my life who did what he could to make sure I would be a normal, functioning kid. As I grew up I got stronger and more mobile. I wrestled from a young age, played baseball and football, and I also wanted a black belt in tae kwon do. I also wrestled in college and participated in track and field. Even though my leg and foot have not been that of a normal kid, I never gave up. About three years ago my foot, ankle and knee began to really hurt, but with my foolish pride and stubborn ways I put off going to the doctor. My previous doctor retired and I didn't want to find a new one. Last year it became harder and harder to get around. Hunting and fishing became more of a chore than the enjoyable experience that I once knew. And work became painful and discouraging as many people started to notice my work pace slow down drastically. A local doctor recommended me to the International Center for Limb Lengthening, RIAO, Sinai Hospital. I made an appointment with Dr. Siddiqui and after going in and getting x-rays, I waited for him. He suggested a major surgery to fix my ankle that was now severely deformed, in my opinion. Well, it's been a long road with two base surgeries and a third because of a mistake on my part, followed by a last one to remove the frame that helped stabilize my leg. It’s been almost a full year since my first surgery and I am writing this with confidence and a great appreciation to Dr. Siddiqui. This post October I went hunting for the first time since opening day of 2012 and I got my first deer of the season. 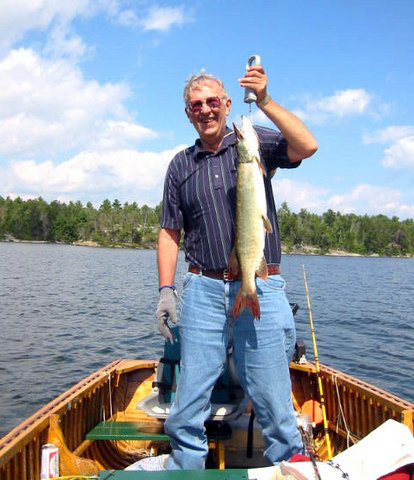 Also, all summer while healing, I fished and camped and enjoyed it. So thank you, Dr. Noman Siddiqui. My son had surgery on July 3, and I would like to thank all those who had a part in taking care of him from the OR to the PACU to the nurses - Bonny, Jennifer and Sarah - who cared for him. To Dr. Monica Agree: Thank you so much for your excellent care and constant communication! Also thank you to the fellows, residents and Dr. (John) Herzenberg. Please forgive me for not remembering all of the names. Sinai Hospital was a great hospital to care for my son. God bless you all! I was recently a patient at the Sinai Hospital. I am writing to say I had the most amazing experience I've ever had in any hospital, and I've been to a few. My care was extraordinary! EVERYONE involved was wonderful. There was NEVER a time where I didn't feel they all cared for me completely. From Dr. Michael Mont's team to the nurses and the PCAs, everyone had my best interest at heart. I can't help but think, as a business owner, everything about the way a company runs, comes from the top down, and filters through to the employees. This note is to say, you and your employees did an outstanding job with me!!! I never felt anything but genuine humanity and care during my stay. In this day of "bottom line" mentality, it is extremely refreshing to know a massive place like Sinai can convey the message of care so well. If I ever need another hospital, it will be Sinai. That's saying a lot, as I live in Port St. Lucie, Florida! I am writing this letter in reference to the exceptional care that we received from a member of your Triage nursing staff, Ms. Mary-Anne Murray, LPN. Every time I had general questions or concerns, relative to my husband’s recovery, Ms. Murray made sure that I was informed, and my concerns were addressed. Ms. Murray always personally returned my calls, answered all my questions, and was always pleasant and respectful. She made me feel as though my husband was the only patient that Ms. Murray was responsible for. In my own words, Ms. Mary-Anne Murray can be described as a “Special Angel.” In all our years of medical treatment, I have never experienced a more soothing, patient, & pleasant woman than Ms. Mary-Anne Murray. Carlyle and her family surprised the entire staff one day by bringing an amazing (and edible) cake that was made by Charm City Cakes. 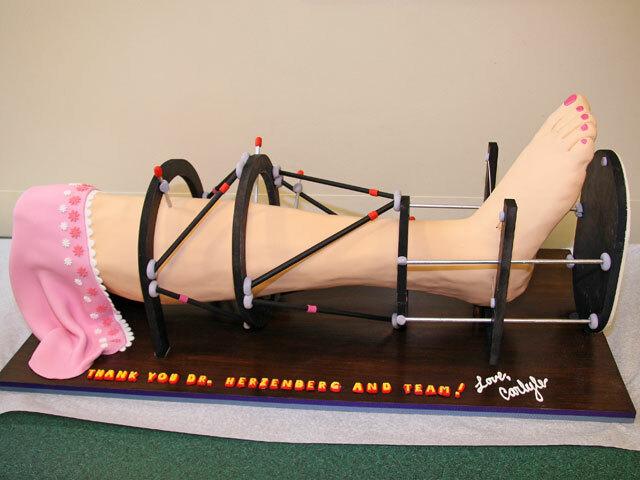 Carlyle asked the artists to make a cake that looked like her leg when she was undergoing treatment. They perfected every detail, from the external fixator to the pink toe nails. "Thank you Dr. Herzenberg and Team! Love, Carlyle" was written on the platform that supported the cake. Patients and staff enjoyed every bit of the cake (even the fudge toes). 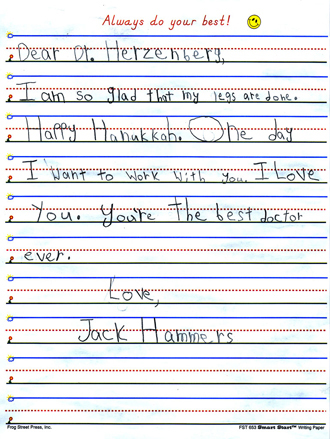 Click here to see an article about Jack in The Washingtonian. I am writing on behalf of my son Nicholas. He is 5 years old and was diagnosed with Fibular Hemimelia at about 1 month old. We decided to have his leg lengthened and his ankle reconstructed at the ICLL because of their experience in treating fibular hemimelia and the confidence in the doctors that my son would live a full and active life without limitations. We understood that to most doctors amputation is the standard treatment for a case like Nicholas and for some children that may be the right choice but that was not what we felt was best for our boy. Nicholas is currently in a fixator for the second time and he is doing great. His first surgery was at 18 months old. Before his first surgery, we were very scared of what it would be like for him: would it affect his sparkling personality, would he be in constant pain? Our fears never came to pass. With both surgeries, Nicholas was off pain medication within weeks and walking and running and dancing and the same sweet, strong and happy boy he was before surgery. When Nicholas is asked about his fixator, he usually says something like this: "Dr. Standard put my fixator on to make my leg grow. He is awesome." Nicholas loves Dr. Standard, and we feel so grateful to have him treating our son. We trust him 100% with our boy and we know that he cares so very much about the lives of all the children he treats. This is a challenging process, but there is a lot of support at the Rubin Institute. I do not think there is any place like it in the world, and we could not imagine taking our son anywhere else. Dr. Standard came to town. For all the ailing children he found. To LIMP into his shop. We began as a pair. And I won fair and square. Thank you, Dr. Standard! You are the best! Tayo was diagnosed with Perthes disease in March 2009 and had the fixator surgery with Dr. Standard in August. He is now about 9 months post-fixator. Tayho shared the most amazing thing with me tonight: today in school (5th grade) they had to write about the worst thing that has happened to them. Tayo says to me, "Guess what I wrote about?" I just looked at him. He said, "Not Perthes. It isn't the worst thing that has ever happened to me. Actually, it is one of the best things. And the fixator is one of the best things too. Think about all the friends we've met. Think about all the things I can do now that I couldn't do before." I just looked at him and said, "Wow. That is such an amazing outlook to have Tayo," and then tried not to cry! We never know how things like Perthes will affect our children. As hard as it is (and I know how hard that fixator can be) our children somehow seem to come through it with a perspective that is positive and that enables them to be better and stronger and more compassionate people. Were it not for Dr. Standard and the team at RIAO, I fear that Tayo would not be in the same place that he is now, not physically or emotionally. Dr. Standard (and the fixator) has allowed Tayo to re-gain all the running and jumping and physical activities that mean so much to him. Dr. Standard and his team have also helped Tayo endure and come through this treatment with courage, strength, perseverance, and a sense of accomplishment that comes from being supported and encouraged by people who truly have your best interests at heart. We will be forever grateful to Dr. Standard and his team for the positive impact they have had on our lives. One of the thirty patients who benefitted from Dr. Herzenberg’s Team Sinai mission trips to Uganda is Buruhan, a now sixteen-year-old boy with a dwarfing condition that made his legs grow into an extreme knock-knee position. Jackie Grant, pictured with Buruhan, is a member of a California nonprofit organization called Buyamba (the Ugandan word for “Help”). The organization works to help educate children in Uganda, and Buruhan is a student in their God Cares school. She learned Dr. Herzenberg would be leading a mission trip to Uganda in 2016 and successfully advocated for the team to help Buruhan because Ugandan doctors could not perform the surgeries he required. In 2016, the mission team operated on Buruhan’s left leg. His leg was gradually straightened over time with an external fixator. In January 2018, they did a minor surgery on the left leg and then performed a procedure to correct his right leg. The external fixator’s correction must be gradual to prevent damage to the peroneal nerve, a branch of the sciatic nerve, which supplies movement and sensation to the lower leg, foot and toes. The team looks forward to the day that Buruhan will hopefully be able to walk independently without crutches. 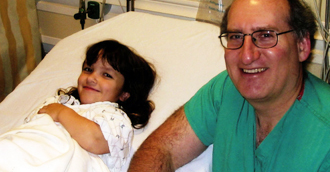 “Because of Dr. Conway, she has her leg,” Lori said during one of her mother Sue’s check-up visits. Sue explained that in 2014, she started to notice her ankle was swelling. After testing for clots didn’t show any problems, Sue had a CAT scan that detected a tumor in her thigh muscle. The tumor was removed, and then Sue underwent six radiation treatments. Later, while out shopping, her leg gave out and she fell, fracturing her femur (thigh bone). A rod was put in her leg, but the wound would not heal. Her doctors began questioning if her leg could be saved. Sue was referred to Dr. Conway for her expertise in fighting infection. Dr. Conway planned to clean out the infection, but during surgery she discovered that the radiation had caused the bone to deteriorate and a lot of the bone was dead. Very little of Sue’s femur remained. Dr. Conway took out the existing rod, and had to put a new rod in that extended from Sue’s hip to her shin. This left Sue unable to bend her knee due to the rod, but her leg was saved, and she still had use of her hip and her foot. Sue began intensive oral and IV antibiotic and hyperbaric oxygen treatments and eventually her wound healed. Today, Sue is proud of her independence and her ability to keep up with her three great-grandchildren. While she can no longer work as a hairdresser, her career for fifty years, she reports that she gets around well with her walker. “I’m still independent—I cook, clean, do the laundry. I decorated for Christmas. I just can’t get on a ladder or drive.” At a visit in early 2018, she mentioned she was going to look into getting special adaptive hand controls for her car so she could eliminate one of those limitations. A year later, she succeeded, and she is now able to drive her van.